Can the GOP Succeed by Running Against Health Care? Having staked the success of his presidency on the longstanding Democratic dream of universal health care, President Obama finally achieved victory on Sunday night, bringing an end to a yearlong partisan struggle. "This legislation will not fix everything that ails our health care system, but it moves us decisively in the right direction," Obama said shortly after the historic vote. "This is what change looks like." With Democrats chanting the signature line of the Obama presidential campaign  "Yes we can!"  the House voted 219-212 to send a sweeping overhaul of the nation's health care system to be signed into law. "We tonight will make history for our country and progress for the American people," Speaker Nancy Pelosi declared shortly before the vote. "Today we have the opportunity to complete the great unfinished business of our country." The Democrats passed the bill without a single Republican vote  and with the knowledge that it may well have ended the political careers of some who voted for it at a time when the public remains deeply divided over the entire endeavor. 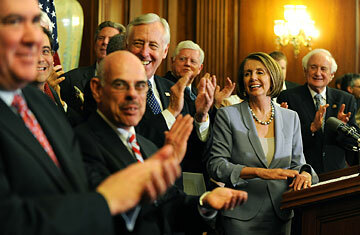 "If we pass this bill, there will be no turning back," warned minority leader John Boehner. "It will be the last straw for the American people." Suspense about the outcome continued until the final hours of the debate. Passage appeared to be assured only after Michigan Congressman Bart Stupak announced in the late afternoon that he and a group of antiabortion Democrats, who had pushed for more restrictive language in the original House bill, had been satisfied that the Senate version would not allow the use of federal funds to pay for the procedure. That only came after President Obama promised to sign an executive order reaffirming that the bill would maintain a "consistency with longstanding restrictions on the use of federal funds for abortion." In reality, that executive order was more a symbolic move than an actual concession; the bill's supporters have insisted all along that it does nothing to change the current federal policy, known as the Hyde Amendment, which has been in effect since 1976. The second bill passed by the House late Sunday will make adjustments to the legislation, such as lowering the impact of an excise tax on high-value insurance plans and stripping out some sweetheart deals like the now infamous cornhusker kickback, using a process known as budget reconciliation. Such changes would be filibuster-proof in the Senate, though that process could still drag on a while if Republicans choose to draw it out with objections and amendments. Even so, it will be an anticlimax to Sunday's historic House vote, which will send the underlying Senate bill to President Obama's desk for signature. As the House debated throughout the day, hundreds of protesters from the Tea Party movement rallied on the Capitol lawn, chanting, "Kill the bill." It was a dead-serious message, but on a glorious spring day, when cherry blossoms were just beginning to appear on the trees, the atmosphere felt more like a carnival  especially compared to the day before, when some protesters had hurled racial epithets at a few African-American members of the House. The crowd was stoked by regular appearances that lawmakers made on a balcony overlooking the protesters. "It's interesting how many faces they recognize," said Republican Congressman Steve King of Iowa. Republicans flashed handwritten signs with the word No on them, sending the crowd into rapture. Democrats also got into the act. Sheila Jackson-Lee, a liberal Democrat from Texas, said she went down among the protesters saying, "God bless America. We're glad you're here." She also flashed two fingers in a mischievous V for victory. The response? "Someone flipped a third finger," she said. On the other end of Pennsylvania Avenue, the President and his team were waiting and working the phones to make sure the final votes were nailed down. There was also the distraction of March Madness to pass the hours. One aide said of Obama: "He's in the West Wing, getting updates, dropping in on staff, and like the rest of America, examining the rubble of his bracket." At one point during the afternoon, the Commander in Chief ordered his health care czar, Nancy-Ann DeParle, to take a break and go out for a run. With passage of the legislation, Obama has achieved the signature domestic goal of his presidency, and the most sweeping piece of social legislation since the 1960s Great Society initiatives that saw the passage of Medicare and Medicaid. Universal coverage is a goal that has eluded Presidents going at least as far back as Teddy Roosevelt, and Obama's bill comes as close to that target as anyone has. The bill would provide health coverage to an estimated 32 million additional Americans, meaning 95% of those who are legally in this country would have health insurance, up from 83% today. The bill also promises to rein in health costs by reorienting the practice of medicine, making it more efficient, with health care providers rewarded on how well they treat their patients, rather than how much care they give them. Whether it actually achieves that latter ambition, however, is far more uncertain. In the early years, most Americans will see only minor changes in the health care system. It will almost immediately end some insurance-company practices, such as denying coverage to children with pre-existing conditions. And dependent children under the age of 26 would be allowed to remain on their parents' policies if they cannot get health insurance elsewhere. Adults with pre-existing conditions would also be able to buy coverage through expanded high-risk pools. Beginning in 2014, more far-reaching measures will begin to take effect. States would be required to set up new "exchanges," or insurance marketplaces, that would offer a variety of health care plans for small businesses and individuals who do not get coverage from their employers. Government subsidies would be available to those earning up to 400% of poverty. Employers with 50 or more workers who do not offer coverage would be fined, and for the first time, most people would be required to obtain health coverage  either at work, or by purchasing it on their own  or pay a penalty. All of this would be paid for in two ways: By reducing spending on Medicare by hundreds of billions, and by imposing a set of new taxes, including a 40% levy on certain high-priced insurance policies. But while the bill is headed toward becoming law, the fighting over it isn't going away anytime soon. Republicans have already issued notice that they plan to campaign in this fall's midterm elections on a pledge to repeal it. There will be constitutional challenges. And in dozens of states, legislatures are considering measures that would attempt to exempt their citizens from some of its provisions, including the requirement that individuals purchase insurance.